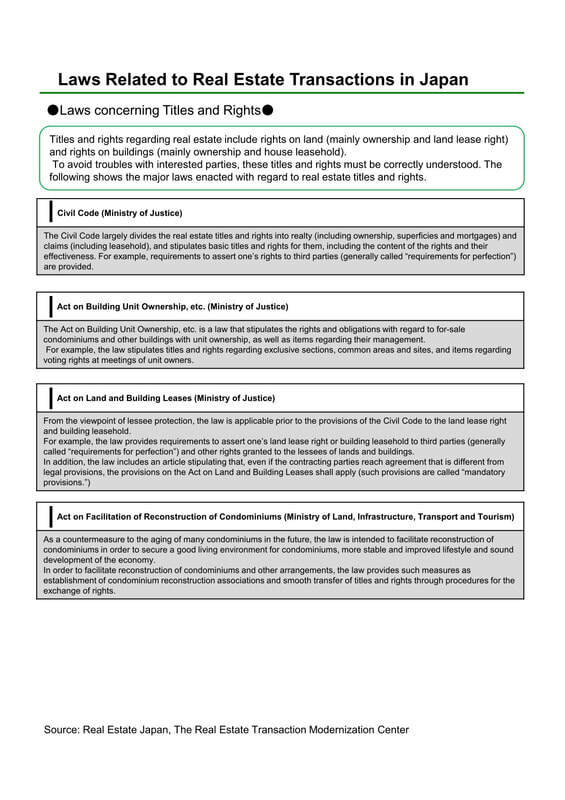 Titles and rights regarding real estate include rights on land (mainly ownership and land lease right) and rights on buildings (mainly ownership and house leasehold). ​To avoid troubles with interested parties, these titles and rights must be correctly understood. The following shows the major laws enacted with regard to real estate titles and rights. The Civil Code largely divides the real estate titles and rights into realty (including ownership, superficies and mortgages) and claims (including leasehold), and stipulates basic titles and rights for them, including the content of the rights and their effectiveness. ​For example, requirements to assert one’s rights to third parties (generally called “requirements for perfection”) are provided. The Act on Building Unit Ownership, etc. is a law that stipulates the rights and obligations with regard to for-sale condominiums and other buildings with unit ownership, as well as items regarding their management. ​For example, the law stipulates titles and rights regarding exclusive sections, common areas and sites, and items regarding voting rights at meetings of unit owners. From the viewpoint of lessee protection, the law is applicable prior to the provisions of the Civil Code to the land lease right and building leasehold. As a countermeasure to the aging of many condominiums in the future, the law is intended to facilitate reconstruction of condominiums in order to secure a good living environment for condominiums, more stable and improved lifestyle and sound development of the economy. ​In order to facilitate reconstruction of condominiums and other arrangements, the law provides such measures as establishment of condominium reconstruction associations and smooth transfer of titles and rights through procedures for the exchange of rights.